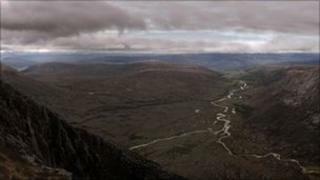 The southern boundary of the Cairngorms National Park has been extended to include parts of Perthshire. The park will now take in northern Perthshire, including Blair Atholl, Killicrankie and Glenshee. The park also incorporates parts of Highland, Moray, Aberdeenshire and Angus. The extension comes as a new study revealed that the economy of the Cairngorms area had improved since the foundation of the park in 2003. The change means that the park is now one fifth bigger and covers almost 6% of Scotland. It is also home to more than 17,000 people - previously the total was 16,000. According to the Economic & Social Health of the Cairngorms National Park in 2010 report, since the park was founded, there had been a 13% increase in the number of businesses operating in the area and a cut in unemployment. The study also found the park had a growing economy worth £398m a year, with tourism accounting for a third of that. The report, commissioned by the Cairngorms National Park Authority (CNPA), Highlands and Islands Enterprise (HIE) and Scottish Enterprise, also claimed more 18-25-year-olds were being attracted to the area. David Green, convener of the CNPA, said: "Highland Perthshire has tremendous natural and cultural value and it offers an enormous amount in terms of recreation. "It truly is a great addition to the Cairngorms National Park. "While designation as a National Park may not be solely responsible for the achievements outlined in the Economic & Social Health of the Cairngorms National Park 2010 report, it is undoubtedly a key factor along with strong working partnerships with a variety of organisations - all of whom have helped deliver these social, economic and environmental benefits." The decision to extend the park was also welcomed by Ramblers Scotland. Director Dave Morris said it was now time for the Cairngorms to be given world heritage status. He added: "Little progress has been made since this was first proposed over 30 years ago. "But now, with the national park in place, with a proper boundary, we need to make the case to the international organisations (IUCN and Unesco) for World Heritage status."